This is a collection of presentations made at F.A.A.S.T. public meetings, enjoy! PLAY with JOY is an Early Intervention program based in Utah, serving families from Cache County to Utah County. 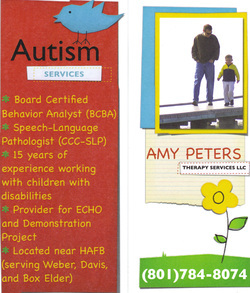 Services are offered to children with autism, and their families. Families are taught the P.L.A.Y. Project techniques and methods to enhance their relationships with their child and to help their child move up the Functional Developmental Levels.